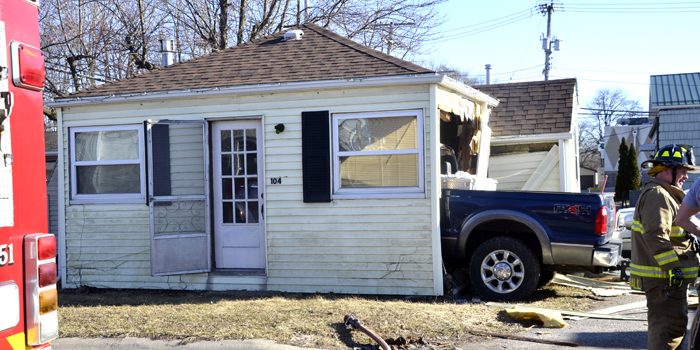 A Ford Super Duty F350 left the roadway, striking a house near the intersection of Buffalo and Prairie Streets in Warsaw. WARSAW — At 5:16 p.m. Saturday, March 23, a 2011 blue Ford F-350 driven by Jaiden M. Wade, 19, North Lighthouse Drive, Warsaw, was traveling northbound on Buffalo Street and was attempting to make a right turn onto Prairie Street. According to information provided in the police report, Wade took the corner too fast and swerved to avoid striking a parked vehicle facing westbound on Prairie Street. When the vehicle swerved, Wade hit the accelerator and continued eastbound on Prairie Street. The vehicle left the roadway and struck a vehicle which was facing south in the parking lot of 601 S. Buffalo St. Wade’s vehicle then continued eastbound and struck a home located at 104 E. Prairie St. When the first vehicle was struck, it was pushed into a second vehicle, which was parked directly south of the first vehicle. The residence sustained heavy damage to the west wall when the truck came through the house. A passenger in Wade’s vehicle, Joann M. Buchan, 35, North Lighthouse Drive, Warsaw, complained of pain to her right shoulder and arm, jaw and right leg, and was transported by EMS to Parkview Hospital in Warsaw. 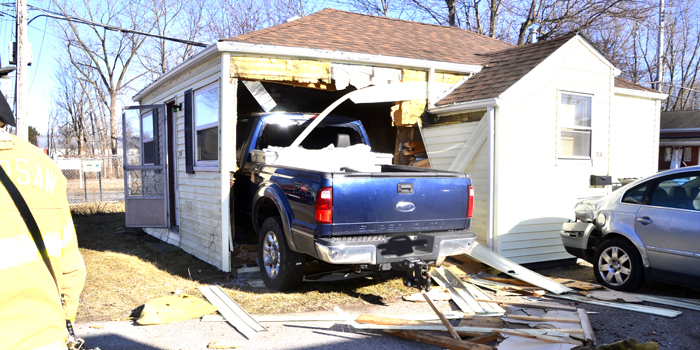 Warsaw-Wayne Fire Department and Lutheran EMS were called to the scene of an accident involving a truck and a house Saturday, March 23.